I have to admit that being in the Military does have it’s benefits!! Are you a military family in need of furniture? Did your child use your mattress as a trampoline? Has your family grown but your furnishings have not? Has your hand-me -down couch seen better days? If so, this opportunity might be for you! 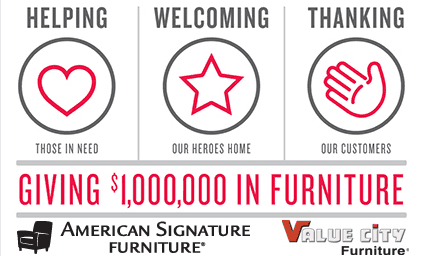 Operation Homefront and our generous partners at American Signature, Inc. would like to thank you our military families by awarding some furniture donations to some deserving military families! Priority consideration will be given to military families with a service member currently deployed or those who have recently returned from deployment. Sign up today to be considered for this opportunity. Families will be selected for this opportunity based on need. Operation Homefront will accept registration for this opportunity until August 10, 2012.